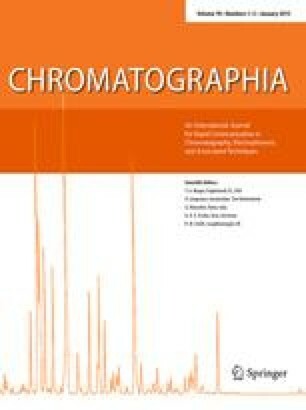 The dependence on molar mass of the retention of oligomers in reversed-phase gradient polymer-elution chromatography (RP GPEC) has been investigated. To this end a variety of oligomer series, including polystyrene (PS) and amorphous polyesters (PE) were chromatographed using different non-solvent-solvent (NS-S) mobile phases and at different temperatures. Sigmoidally shaped curves were usually obtained for plots of amount (%) of S against 1/√ (molar mass) but the exact shape varied from almost linear to very convex. Increasing the temperature led to increased dependence of retention on the molar mass; this can be ascribed to a decrease in Flory-Huggins interaction parameters. Changing the NS-S system substantially affects the shape of the curves, but the effect is different for different oligomer series. From results from isocratic measurements for PS and a PE it was found that the effect of experimental conditions can be ascribed to the relative contributions to retention of both end groups and of the monomer repeat units. Because these contributions are affected to different extents by chromatographic conditions, changing these conditions also affects the shape of the plot of the amount of S against 1/√ (molar mass).